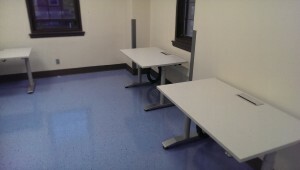 We recently completed an office furniture installation at the US Department of Veterans Affairs in Canandaigua, NY. The installation was completed in two phases, in neighboring buildings on the campus. Phase one of the project was installation of 52 standing height desks in a redesigned wing of the building. The desks were placed three or four to a room once installed, and then cabling had to be run for the standing height control box. This phase of the project was scheduled for two days; however, it was completed in just one day. Phase two of the project involved receiving, delivering, and installing various office furniture for a new wing devoted to patient rooms and employee space. The space included a receptionist desk, waiting room furniture, office desks, a conference table, and seating. The installation was completed on the same day as the delivery. The project was completed in only two days, instead of the three days required by the client. Our New Site is Live!